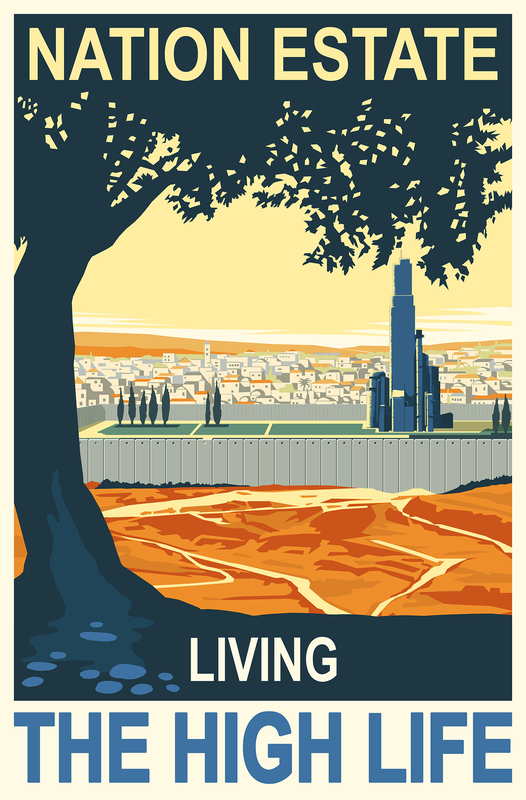 Having a somewhat remote interest in science fiction (mostly as contradicting affinities either towards consumerist escapism or anarchist imagination), Afrofuturism 2.0 proves to be not only an educational experience, but a necessary provocation of questions on Pan-Arab culture, which may be read through various Palestinian states of being – whether present, absent, or imagined. Afrofuturism as an expression first surfaced in the work of Afrofuturist forefather, Jazz musician Sun Ra, from the depths of 1950s American institutional racism and marginalization. Ra has mixed various African symbols, poetry, and philosophy, through extra-terrestrial transfiguration and fantasmic amalgamation of ancient and alien technologies, in a manner that recaptures, reimagines, and revises Afrodiasporic history and present – often with a tint of sarcasm. In his film Space is the Place (1974), “Ra attempts to save Earth’s inhabitants by offering them off-world employment with Outer Spaceways Incorporated, but seeing that the position provides no pay and requires giving up Earthly pleasures and vices, only a handful take him up on the offer” (Anderson and Jones, 2016:65). Throughout the 1970s, Afrofuturistic expression was taken up by Funk musician George Clinton, becoming a notable musical genre, then a more pronounced artistic framework through the sci-fi literature of Octavia Butler and Samuel R. Delany, until it became a recognised discourse through the critical and scholarly attempts of the 1990s (Mark Dery, Kudwo Eshun, Mark Sinker, and Paul Gilroy, for example). In 1993, the term Afrofuturism was coined by cultural critic Mark Dery in an attempt to address the scarcity of Black sci-fi productions in the face of the total lack of representation of African Americans in popular science fiction. Since, Afrofuturism has been evolving into a wider Pan-African cultural propinquity, by navigating the future, present, and past through the use of advanced technology. 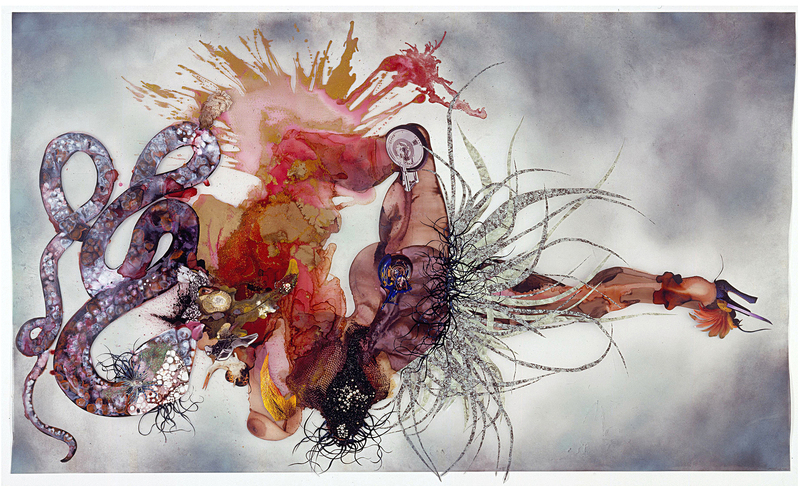 Ink, paint, mixed media, plant material and plastic pearls on Mylar. 54 x 87 in. Taken from a wider perspective, Afrofuturism, as the book seeks to assert, can be moulded into a vibrant, analytical framework for exploring notions and practices of temporality in African cultural production. Indeed, the numerous studies and examples that unfold across the different parts of the book point to the rising instrumentalization of futurist and sci-fi aesthetics as important politically charged practices within contemporary Afrodiasporic culture. However, critics have raised doubts on whether Afrofuturist sci-fi has anything to do with Africa as much as it has with Western cyber cultures, technocapitalism, and power structures. In fact, non-diasporic African futurism remains steadily absent throughout the whole book. Whether such futurism is emergent or not, its lack of mention indicates that the African/diasporic historical rupture might be greater than the attempt to reconcile Pan-African cultural production under an Afrofuturistic microscope. The question of a truly Pan-African futurism remains an issue for future negation. Yet, Afrofuturism, as both theory and practice leaves a thoughtful inkling in the mind of the present-day diasporic reader, by evoking inferences regarding history and alternate futures in a Pan-Arabist context. From a Palestinian readership perspective, Afrofuturism conjures echoes of lived experiences and collective memories that relate to Afrofuturistic threads such as the apocalypse that has already happened, the unattainable return to the normal, power regimes of colonialism, racism, marginalization, displacement, and collective identities of self-victimization. But Palestinian narratives of loss, dispossession, and catastrophe have to be seen as part of wider Arab narratives and from within a Pan-Arabist perspective. In doing so, Palestinian and Arab cultures may be able to venture on a post-post-colonial exploration of self and collective identities. In this sense, and through such reading, (Afro)futurism can offer diasporic7 cultures a way to deconstruct and reconstruct history in a manner that infiltrates territorial and mental borders. Notions of belonging are constantly challenged…there is no homogenous culture or identity…The use of “-futurism” here is not intended to reference Futurism as movement, neither is it an explicit reference to the “futuristic”. Instead “-futurism” is anticipating a future, it signifies a defiant cultural break, a projection forward into what is, beyond ongoing eurocentric, hegemonic narratives… these ideas can contribute to a growing counterculture of thought and action that through time will be found and used in the construction of alternative states of becoming. While this may be a first utterance of Arabfuturism, unproclaimed Arab futuristic expressions have been increasingly surfacing in recent years. In a tedious online search for glimmers of Arabfuturistic expression, leading to distant corners of the Internet, an unusual image pops out. Helmet (2016) by Lebanese artist Ayman Baalbaki is an unsettling but beautifully mesmerising artifact from an indiscernible past/present/future. The impeccable design of Arabic calligraphy, engraved on hard-crafted metal, conjures themes that relate to Islam, militarism, and even astro-science. The mixing of the ancient with the futuristic makes any possible representations automatically paradoxical. 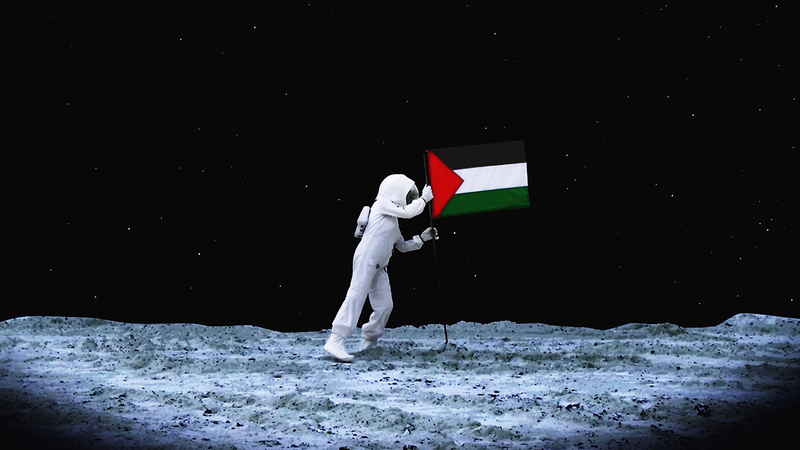 Beyond being a naïve fantasy of a reality in which Palestinians are able to reach the moon, A Space Exodus is a grim visual image of a Palestinian expelled as far as the moon, drifting alone in outer space, and into oblivion. Later that year, Sansour developed a complementary short photographic sequence of tiny plastic figurines of Palestinian astronauts that keep multiplying into more and more astronauts. 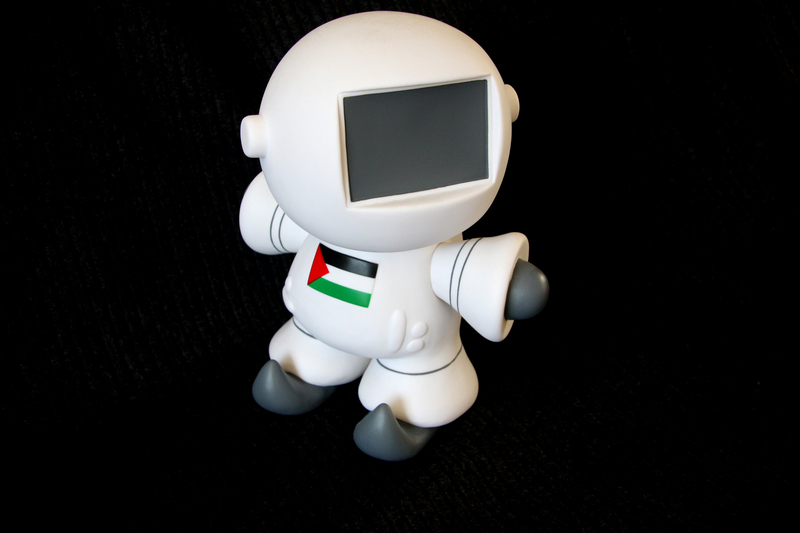 Palestinauts (2009) is a gesture towards the increasing number of Palestinauts that “have long since taken matters into their own hands” in exodus, diaspora, and astro-existence. Yet another example of her work, titled Nation Estate (2012), is a short sci-fi film exploring the dystopian architecture of Palestinian statehood, envisioned in a vertical skyscraper with glass walls, revealing a view of the land decorated by the still-standing Apartheid Wall. However, as with Afrofuturism, there is a persisting disparity in Arabfuturism between diasporic and “native” futuristic expressions. In the Palestinian context, this disparity is sharper than in the rest of Arab culture. The examples of Europe-based artists, such as Sansour, Baalbaki, and Majali, demand deeper examination of such discrepancies. One possible explanation may reside in the ways that power structures in the Middle East administer collective imaginaries that foster victimhood, nationalist/religious fixation, and catastrophic (Nakba) cognitions. Intro - المقدمة from Tashweesh - تشويش on Vimeo. It is possible that Arabfuturism is still solely the domain of diasporic expression, yet the examples brought hitherto merely scratch the surface - they suggest that a deeper delving can turn our dystopian realities into a “pan-utopian” inquiry of the present, from the perspective of a future. 1. Anderson & Jones, Afrofuturism 2.0: The Rise of Astro-Blackness, (London: Lexington Books, 2016), vii. 2. Sinker in Anderson & Jones, 64, emphasis by L.S. 3. Note Sinker’s inescapable irony of “Alien Nation” as an Afrofuturistic disposition of alienation. 4. Anderson & Jones, 79. The Middle Passage is the term used to describe the sea journey undertaken by slave ships from West Africa to the West Indies carrying millions of enslaved Africans to the “New World”. 5. A fictional or hypothetical person whose physical abilities are extended beyond normal human limitations by mechanical elements built into the body (Oxford Dictionary of English, 3rd Edition). 6. Anderson & Jones, 17-18. 7. Diasporic cultures as cultures torn apart by displacement. The diasporic could be in nativity, in exile/refuge, or anywhere in between. 9. Sansour had recently opened a solo exhibition titled “In the Future They Ate from the Finest Porcelain”, at The Mosaic Rooms in London, on view through August 20, 2016. 10. Part of Ramallah Underground collective. 11. Alex Ritman. "Running Interference: Tashweesh Have Come a Long Way from Hip-hop Roots" The National. May 3, 2011. Accessed June 02, 2016. 12. Anderson & Jones, 80.